A simple and savoury seduction that will satisfy your inner Greek god and goddess. Place the red peppers on a baking sheet, and bake until they are charred. Remove the peppers from the oven, and place them in a large resealable bag. Let stand for 5 minutes before removing, peeling and de-seeding the peppers. In a frying pan, pour the olive oil, and sauté the garlic and chopped olives over medium heat for a minute. Add the peppers, and sauté for another 3 minutes. In a blender or food processor, combine only the pepper mixture and feta. Sprinkle in some chili flakes, and pulse until smooth. If the dip is too thick, add more olive oil. 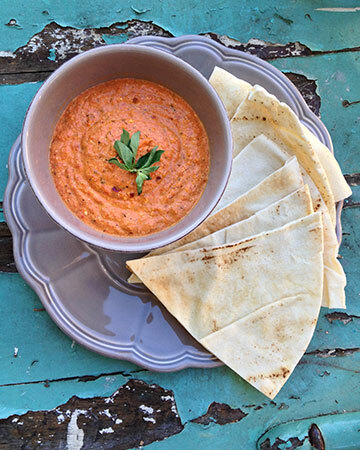 Spread the smooth infusion on fresh bread, pita or even crackers, and bite into a taste of the Mediterranean.